Essie's new Encrusted Treasures Collection is set to hit store shelves November 2013, but today I have the first of the six polishes in this collection. Lots of Lux* ($9.95 CAD) immediately captured my attention, and I just had to get it on my nails. The Encrusted Treasures Collection combines a wide range of textured polishes, and this one definitely doesn't disappoint. 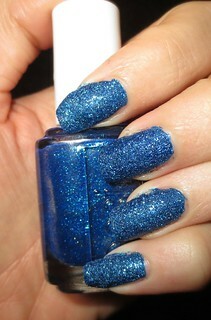 Lots of Lux dries to a finish similar to that of OPI's Liquid Sand polishes. This polish definitely does leave your nails feeling gritty to the touch, but I really don't mind at all. This bright royal blue shade is to die for, I absolutely love it! 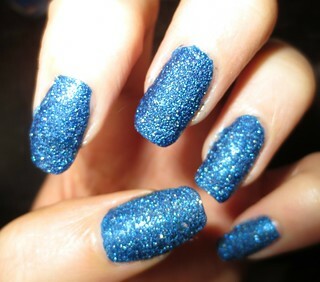 I think that this shade of blue will be perfect for the Fall/Winter months, and I love that it isn't too dark or vampy. There are a ton of shimmer pieces in this formula, but this polish does dry to a matte finish. I decided to skip the top coat with this polish, since I loved the way that it looked on it's own. If you did want a shinier, glossier finish, then you can of course add your favourite top coat. I haven't experienced any chipping with Lots of Lux yet, even without the added protection of a top coat. I wouldn't change anything about Essie's Lots of Lux: it was completely opaque in two coats, application was easy, and it dried completely within only two minutes! I highly recommend scooping up this gem of a polish once it hits stores in November! Oh my gosh, this polish is gorgeous!